Mercedes-Benz UK Truck Division (MBUK) has appointed DBMT to run a launch event for the new Actros - the flagship model in its truck range - following a four-way pitch. 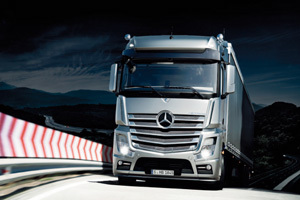 The event will be held in April at the Hilton Birmingham Metropole on the eve of the Commercial Vehicle Show and will showcase the innovation of the Actros, in terms of comfort, economy and driving dynamics. As well as the formal UK reveal of the new Actros, the event will incorporate product knowledge briefing sessions and a celebratory dinner, where both dealers and Mercedes-Benz UK management will host around 500 invited VIP customers. DBMT will be responsible for the creation of the visual identity, production, delegate communications and logistics management. Mari Dyson, truck marketing manager at MBUK, said: "DBMT's solution was both exciting and innovative and perfectly encapsulated the way we wanted to showcase the technology of this ground-breaking product and also to create a really powerful visual impact with our customers as they encounter the new Actros close up for the first time." DBMT managing director David Bottrill added: "New commercial vehicle products of this nature only come around every 15 years, so it is going to be a special event. This win represents an expansion of our long-standing relationship with Mercedes-Benz."